I recolored the dress from the offwhite x white version since i didn't like the colormatching... now its a toned down prussian/lighter navy blue. A really beautiful color. I also put ivory highlights onto the dress to reflect the lighter underskirt in ivory. If needed i can send you worn pictures to reflect the color better - just ask :) I removed the belt ribbon since the ends were frizzy. 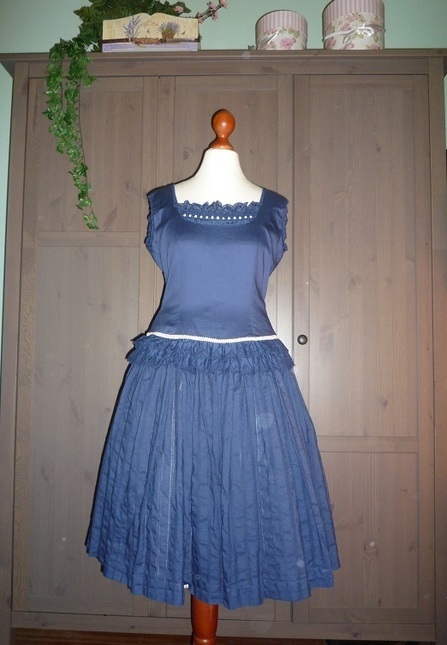 Will fit up to around 91 cm bust and around 72 cm waist. The second picture is with flashlight, the first one is more the real color.